The other day I was talking about immune recognition of human endogenous retroviruses (HERVs) in tumors. (HERVs are the husks of ancient retroviruses, now trapped in our genomes. Some of them still express various proteins, either under normal conditions or when stimulated, as in tumors.) One of the reasons this is an interesting finding, is that HERVs may offer a relatively constant antigen, even though the tumors themselves may be highly variable. There are other, rather obvious, scenarios in which we would like to have a constant antigen in the face of an antigenically-variable disease. For example, HERVs have been proposed to be useful vaccine targets in HIV infection. One of the many obstacles to overcome in developing a vaccine against HIV is the virus’s rapid mutagenesis. 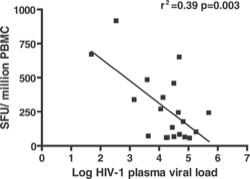 Because of its error-prone replication, HIV can readily escape a lot of immune recognition. Especially when cytotoxic T lymphocytes (CTL) recognize a limited number of antigenic targets, all the virus needs to do to escape immune control is mutate a single amino acid. Usually once the virus does this and escapes immune control, new CTL arise and once again shut down the virus, but only to have new escape variants arise and replicate. 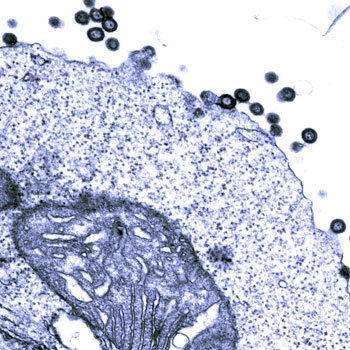 Over the multi-year course of an HIV infection, there may be dozens or hundreds of major HIV variants, each escaping temporarily from CTL and destroying T cells during their limited period of freedom. There are several strategies aimed at reducing the effectiveness of immune escape: targeting multiple HIV antigens, so that the virus would have to simultaneously find many mutations at once; targeting regions in the virus that are so essential that they can’t tolerate mutation; and so on. But wouldn’t it be nice if there was an antigen that wouldn’t change? As endogenous retroviral sequences are fixed in the human genome, they provide a stable target, and HERV-specific T cells could recognize a cell infected by any HIV-1 viral variant. 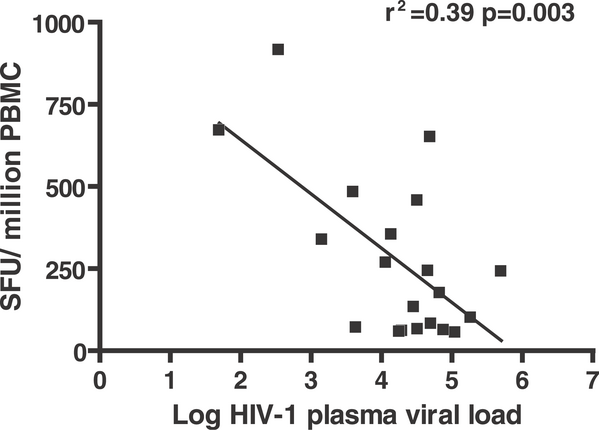 HERV-specific immunity is an important new avenue for investigation in HIV-1 pathogenesis and vaccine design. Let’s go back to a paper6 I mentioned last year, where a group looked at genomic variation linked to disease progression in HIV. They found three genomic regions that were linked to viral set-point; one is an RNA polymerase, one is in the MHC region and affects levels of the MHC class I gene HLA-C, and the third … well, the third is a HERV, called HCP5. The authors pointed out that HCP5 might not be the actual factor involved, because it might be riding along with HLA-B*5701, an MHC class I allele that’s associated with HIV resistance (and I noted that natural killer ligands MICA and MICB are also close by). Still, they clearly like the idea that HCP5 is itself directly involved. They suggested that it might act by an antisense mechanism or something, but I think it might be very interesting to look at CTL responses to HCP5 proteins. One of the genes I’m interested in is an aminopeptidase called “ERAP1”1 that’s involved in antigen presentation.2 ERAP1 is a member of a family of closely-related genes, roughly 50% identity, that in humans and many other mammals are adjacent on a chromosome. That is, on human chromosome 5 (figure to the right), there are three genes side by side: ERAP1; ERAP2; and LNPEP, all of which are clearly the result of gene-duplication events at some point. Several other mammals have the same arrangement. The neighbouring (non-ERAP-related) genes are the same, also, for that matter. In mice and rats, however, there’s a different arrangement. ERAP1 is on chromosome 13, LNPEP is on chromosome 17, and there’s no ERAP2. So it seemed that the most likely scenario was the in the rodent lineage, there was a chromosome break right between ERAP1 and LNPEP, right in the middle of ERAP2, that destroyed ERAP2. However, it was also possible (though I thought less likely) that there was a fusion — that having ERAP1 and LNPEP on different chromosomes was the basal situation, but that the chromosomes merged in the non-rodent lineage, with a gene duplication arising from the chromosome fusion. Or something like that. Fish have members of the ERAP family, but I wasn’t confident in assigning them to ERAP1, ERAP2, or LNPEP — the mammalian genes are too similar for me to be confident in my feeble bioinformatic understanding. But the platypus genome that just come out gives a lot of support to the idea that rodents split their chromosome from the basal patterns. To the left (click for a larger version) is the appropriate platypus chromosome. 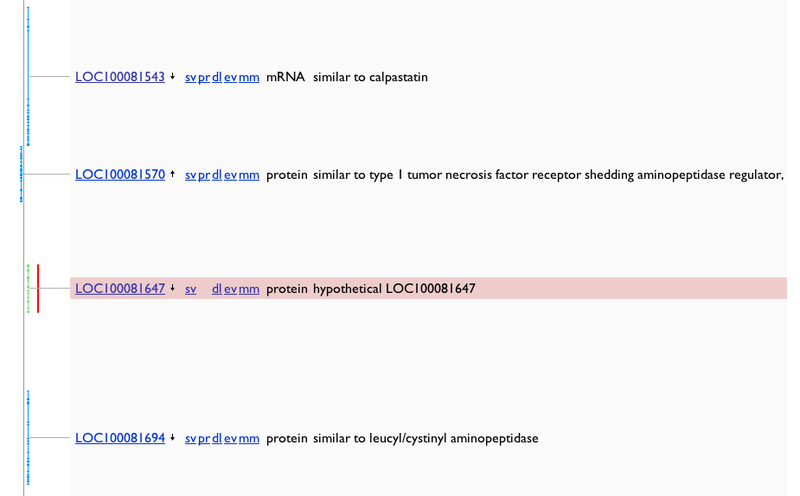 ERAP1 (here called “similar to type I tumor necrossis factor receptor shedding aminopeptidase regulator”) and LNPEP (here called “similar to leucyl/cystinyl aminopeptidase”) are on the same chromosome, and in between them is “LOC10081647” — something the annotation called a pseudogene, which it may well be, but it’s ERAP2. I haven’t had time to do any careful alignments, but it aligns more closely with mammalian ERAP2 than anything else. So almost certainly mice and rats lost ERAP2, though it may have been a pseudogene at that point, and other species either kept a functional ERAP2, or somewhere along the line turned a pseudogene into a functional enzyme. This is not a big deal and likely won’t lead anywhere, but it’s an answer to a piece of trivia that’s been bothering me a little on and off for about 5 years. So yay for the platypus genome.